"Buy One", "Get" 1 FREE! Buy One Get One Free ! 000or Fast 1-Click ordering! On or Off in 1 Second! 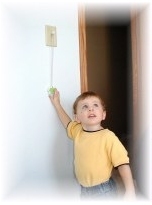 Click Here for "Demo Video"
Finally a product that helps my child turn on and off the lights, and he doesn't have to climb to reach the light switch. No climbing, No falling, No crashes....Now small children can safely turn on the lights by themselves with the "Just out of Reach" Light Switch Extender for kids! No tools are required, it's re-useable in any room, and it installs in seconds leaving no markings behind.Just Out of Reach also gives kids that extra boost of self esteem being able to do something on their own. © Copyright Just Out Of Reach. All rights reserved.